While interest rates are important, there are many factors that play into the fundamental analysis of future price direction. On the other side of the ledger you have the income needed to pay the mortgage. 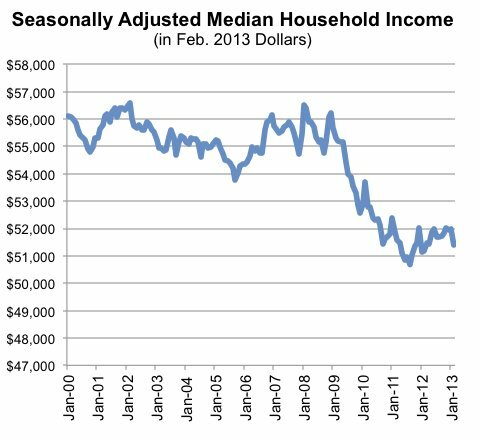 You can track the health of this metric by following the median income in the United States. As you can see in the chart below, real wages have plunged and tracked sideways. 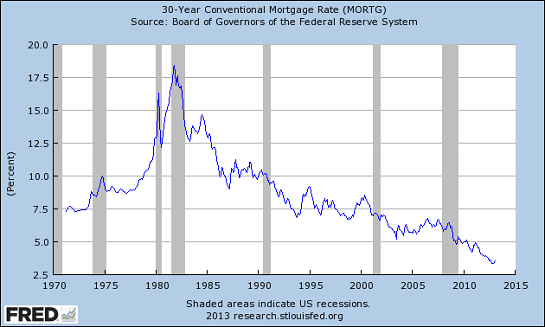 This does not bode well for the income support needed to make higher mortgage payments. A third factor is the cost of living, or the cost of everything else a homeowner needs to pay for every month. For example, if the cost of gasoline, food, utility payments, health care, college tuition, and everything else a homeowner must pay out every month is falling then they have more room at the end of the month to make higher mortgage payments. What we have seen unfortunately is the exact opposite. The following chart from shadow stats shows the government's consumer price index which has essentially been above 2% for a decade (red line). Shadow stats shows a more realistic cost of living increase which has been rising about 5% annually over the last decade (blue line). Residential real estate has seen a major force come into the market over the past year that has provided a major boost upward in prices. Large investment funds have entered major markets with large swaths of cash to purchase homes to rent out. How do we know that these cash buyers have been the major driver of home prices? 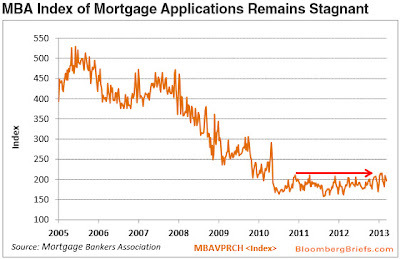 The following chart shows mortgage applications (real working family buyers), which have plunged and flat lined. 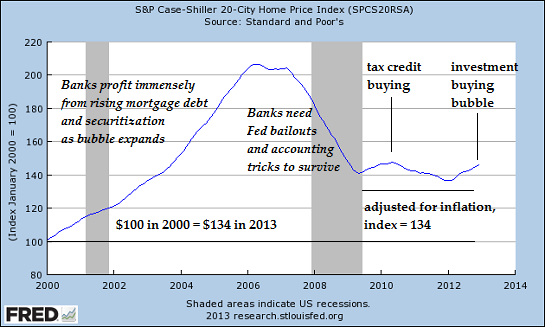 Since home prices experienced their first dramatic dive back in 2007, we had the tax credit buying in 2010 that created a brief blip upward in pricing (and sent everyone into euphoria). When that passed prices resumed their downtrend. Most recently we have seen the investment buyers enter the market, shown below, creating the next push higher (and the next round of real estate euphoria). This enormous new demand has been countered with banks holding millions of home off the market, creating the ultimate 1-2 punch of both artificial demand and supply. We can look to Las Vegas for a perfect example of this phenomenon because it is a city that has experienced a recent (unexpected) price surge. I highly recommend reading the following article in full from a local real estate agent in Las Vegas, but I will provide just a taste of it below. State and federal policies that were supposed to support home ownership have backfired and become anti-homeowner. The policies have locked out future Las Vegas homeowners. AB 284, enacted in 2011, had good intentions, but the results have been disastrous for the Las Vegas real estate market. Most bank servicers have not been able to file notices of default since October of 2011. This has created an artificial shortage that is unprecedented. There are now 380 bank-owned homes available on the market, 466 short sales on the market and 2,290 traditional sales. These traditional sales are mostly flips and investors unloading near the peak. Fifty-nine percent of mortgages are still underwater in Southern Nevada. What’s so astonishing about those figures is there is no real shortage. There are 50,000 vacant homes in the valley and average owner-occupants have slim to no chance of winning their offers. After the passage of AB 284, many homeowners realized they could live for free for long periods. 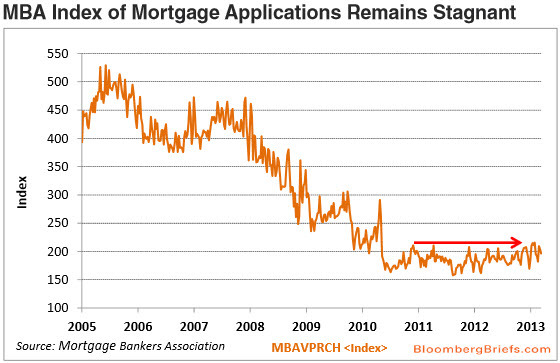 Thousands of homeowners are on years three and four without making a mortgage payment. Lender Processing Services reported a few months ago that the average person who stopped paying has been in his home more than 24 months. This trend, that I have been describing here month after month in detail, is taking place in major cities across the country. In the years ahead all these trends will reverse making this most recent housing rise even more artificial than the government housing credit. 2. Investors will begin to see rent declines as this new supply of homes floods the market and the real economy (jobs and income) does not improve. They will begin to unload their recent purchases onto the market as sales. This is already beginning to happen, see 2005 Or 2013? Developers Hosing Lavish Parties For Get Rich Quick Speculators. 3. The final bastion of hope for the market, lower interest rates, will reverse surprising everyone and pricing potential home buyers out of the market. Great Post! It's very nice to read this info from someone that actually knows what they are talking about. I am extremely surprised by the data of this weblog and i am happy i experienced a search over the site. Thank you so considerably for sharing this sort of great information. FDIC Review: What Backs American Bank Accounts? Is Cyprus The Canary In The Coal Mine?